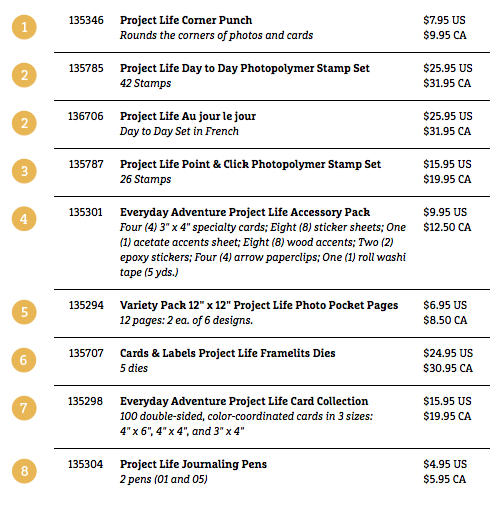 Why do I love Project Life so much?? As a child my Nanna and Pappa had a wall that Pappa made into a bulletin board. Nanna covered the board in pictures that caught her eye. She was always taking photos, as were the many siblings and cousins, many seemed to land in her hand and a small percentage on her wall. As a kid I would stand and look, touching the photos of those I loved and some I didn't know. Legacy pictures of family long since passed to a recent picture of my cousins and I playing canasta (our family game). My Uncle and Aunt scanned all the photos and split the pictures for the family after the passing of my beloved grandparents. I now have a large gallon sized bag of pictures that I am in. I don't have those of my great Uncles and Aunts, etc. So, as a mom of 6, I want to leave a legacy of love for my kids. One they can have in one location (off of my phone and Facebook and into actual books) and that they can touch, remember and enjoy. There is just something so special about touching a photo, seeing your loved ones in them, yourself, and having the chance to go back again and again when your heart desires. With as many kids and activities we have I have to have a simple but stylish, easy and fun way to do so. 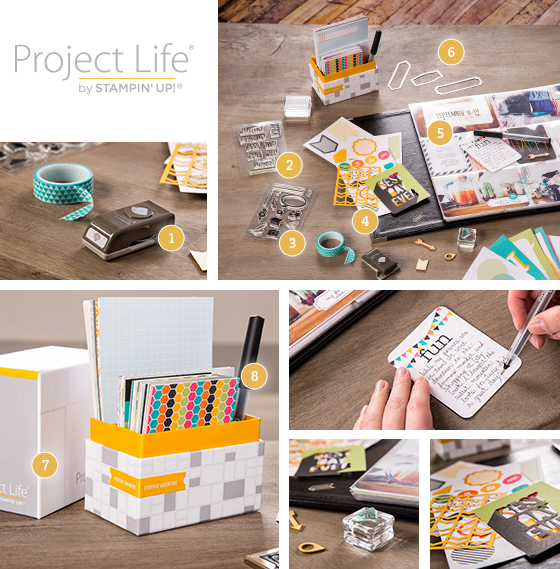 Scrapbooking material load my garage but I found that this system, Project Life and how Stampin' Up! 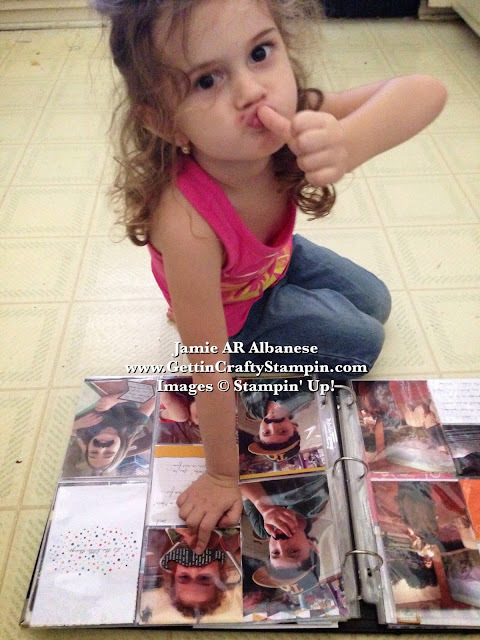 paired with them, gives me colorful, fun, easy and stylish cards to create 12" or 6x8" books QUICKLY - score, baby! As I clean up, if I don't find an activity for my kiddos, they will destroy a different part of my home. So my youngest wanted to see some photos... we grabbed the 12" book and brought it to the kitchen so that I could clean. I loved how cute she is looking and enjoying the photo. Here, back on Cinco De Mayo we had a fun mustache and taco night.. she was busting up at seeing her siblings in mustaches. Because she was asleep during the mustache fest, using our Mustache framelit I created her personalized mustache out of our cool Designer Series Paper. See THIS Post here! I love this system, even the way you store the collections! They come and all fit, by style and collection, in these handy-dandy boxes! I LOVE them - the Card Collections come in a box and yes, the Accessories will fit in, too!! Easy storage in my limited space at home!! It is SUCH FUN to see my kids, hubby and family, even friends, enjoying our memories and sharing them with one-another. Memories don't have to be from a long time ago.. sometimes it's fun to see what we did on a recent trip of event. Being able to quickly get those pictures into books and books that look good makes me feel like a Super Mom and Wife! I love flipping through our memories and seeing how fast the kids are growing, don't you? From a double date with friends, sporting events, a fun dinner, time on vacation, or just everyday life... there are so many reasons to celebrate and document. Join me in Documenting and Celebrating our Memories (every Monday there is a post of Memory Documenting and Celebrating and we have a Once-A-Month Club that meets to crop and create pages for our books. Click HERE for More info!) and find Joy in the midst of the chaos we call life.